Attempting to sum up the last oh, twelve years of my work in a pithy few paragraphs for my newly re-designed website (kudoes once again to Michelle Moore, my website guru) is no easy thing. I live inside these books so any time I have to stand outside them and say something in a more objective tone, I have to struggle a bit in my head. Writing has become such a natural part of my life that I don’t really think about how or why I do it anymore, I just do it. * A long time ago someone, referring to the long conflict in Northern Ireland, asked me the question ‘The Irish, do they even know what they are fighting about?” These books are my answer to that question. Ireland is one of the grand passions of my life, writing is another, so when the time came to get serious about my life’s work the two things were a very natural fit. I wanted to tell the story of Northern Ireland though, and for whatever reason it was the modern era of the Troubles that called to me most strongly. The characters have been with me for a long time, and feel like family to me now. A reader once said to me that these characters felt so real to her that she was certain they had existed somewhere, some time and had chosen me to tell their story. I often feel that way myself, I just get out of the way and let them tell their story through me. These books are Irish history, yes, but they are also the story of people who live inside that history, with all the foibles of humanity—love, hate, revenge, joy and sorrow. They are the story of marriages, friendships and lives lived out under the weight of an extraordinary history in an extraordinary country. 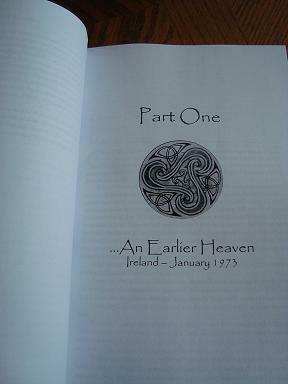 Flights of Angels has begun its journey in the world with pre-sales of the ‘real’ book and an early release of the Kindle version, and so far the sales have been very gratifying. For me each book is one more part of the overall picture, as though I slowly fill in the entire tapestry. People are already asking about book four- ha! I only have bits and pieces written, and only some of the story is there. What is there already though is the framework of the Troubles and how that will direct that next book. The working title, by the way, is In the Country of Shadows. It’s a title that plays out on a few levels- that much I do know at this point. In the meantime, I hope you will all pick up a copy of Flights of Angels and come away with me to Ireland and the cold beauty that is Russia. Well, it’s all done and dusted. I’ve signed off on the proof copy of Flights of Angels and it is now on its way to its own life. It’s a bit like a child leaving home, you hope they do well, remember to take their vitamins and that all the time, love and care you put into them pays off. I’ve had the proof copy for a week now, and it was only today that I stopped moving it around the house with me, depending upon which room I was spending time in. I’m getting used to its presence as a ‘real book’. I still sniff the pages occasionally- who doesn’t love the smell of fresh pages and ink though? I feel a bit lost, though it’s not like I don’t have a bunch of things to be doing- I need to revise bits and pieces of the first two books to get them ready for their second editions, and snatches here and there are emerging from the fog to tell me what book four is going to be about. Thank goodness, because I always worry they will not let me back into their world. But for today I think I will just take a deep breath and enjoy the moment.